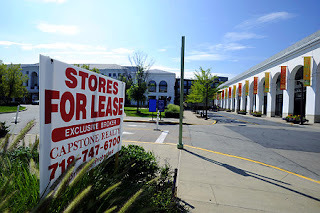 Today I share with you the cautionary tale of Atlas Park in Queens, New York, a promising outdoor mall that is now in bankruptcy proceedings. Although a mall, the lessons here are important to commercial district managers, who often overlook the importance of tenant mix to the overall success of their districts. They focus instead on marketing, promotional events and improving the public realm – all important elements of a commercial revitalization strategy – but at the end of the day, even when all of those elements are in place, the wrong tenant mix can make or break a district. What Happened to Atlas Park? The Shops at Atlas Park was built in 2006 as a high-end, open-air mall located in a decidedly middle-income neighborhood in Queens, NY. In the beginning, management likely targeted high-end stores in the hopes of differentiating the mall from nearby malls with a more workaday appeal. When it opened, expectations were high. The mix included an eight-screen Regal movie theater, and high-end retailers Jos. A. Bank, Florsheim and J. Jill, as well as a gourmet specialty food store. As a resident of nearby Jackson Heights, I was excited to discover Atlas Park. The landscaping and aesthetics, including a beautiful outdoor plaza with lush landscaping, were like something out of a movie set. On our few excursions, my husband and I were pleased to see live outdoor music performances and a small carousel for the kids. We looked forward to visiting again and enjoying outdoor dining during the warm months. But our excitement quickly soured when we realized that besides food, there was nothing else there for us. The shops missed the mark – they seemed to be targeting a crowd that didn’t reflect the reality of who their shoppers really were. Every time we visited Atlas Park, we saw more and more vacancies. As attractive as the shopping center was, there wasn’t enough interesting retail to keep us window shopping, much less buying, for more than 20-minutes. Not good. Although it’s not quite possible to ‘start over’ when you don’t own or control properties in your district, the message here is that you can’t underestimated power of tenant mix to make or break your efforts to improve your commercial district. And while more challenging, it is in fact possible to influence tenant mix through a variety of strategies. For example, my firm is currently working with a Business Improvement District to execute a leasing and retail plan we helped devise. We took a good look at what the district was already known for, identified the market dynamics and likely shopper profile, and defined a strategy to position the district as a destination for great ethnic food and, interestingly enough, a good selection of home goods stores. Today we are working together with a few key property owners who have bought into the concept, and have begun to identify and reach out to a set of qualified prospects that will help round out and improve the retail categories and tenant mix we have already identified. This level of proactive tenant recruitment for private properties is sophisticated and a bit unusual – but is a critical component of driving retail sales and increasing shopper visits to the district – something that will help all district businesses in the long run.